My capsule at the Ace Inn Shinjuku. The capsule hotels in Tokyo are yet another example of the Japanese attitude toward efficient use of space. 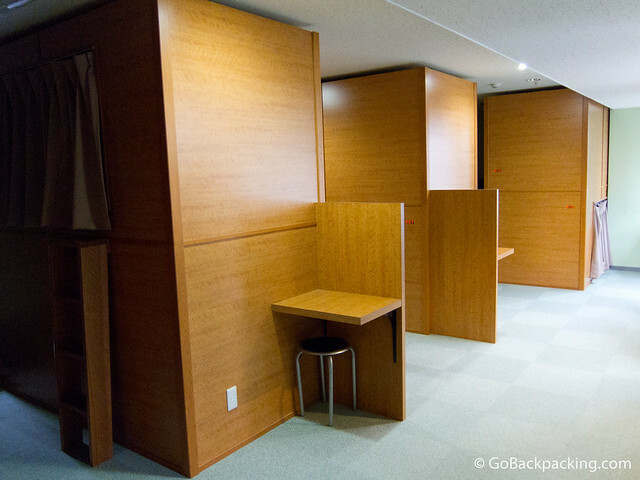 Capsule hotels offer guests a very small space to sleep at night, along with the use of common bathrooms. The big hotels integrate onsens as well. They are budget friendly by Tokyo standards, and if you're wondering why a resident might subject himself to such a tight space, consider that it's the perfect solution for workers who might get drunk at a happy hour and not be in a position to return home for the night. After my less-than-ideal experience at a Japanese onsen in Kyoto, I decided not to go to a big capsule hotel. The reviews I read online made them seem less than desirable, though I suspect part of that had to do with the culture shock foreigners faced when experiencing their first onsen. A room devoted to sleeping capsules. Instead, I chose the Ace Inn Shinjuku, which had a whole floor devoted to glorified bunk beds encased in wood paneling, with privacy curtains and external desks. It was actually rather fun to spend the night there, mostly because I had wi-fi access and could camp out in my little space and not be bothered by whoever else was in the room. It reminded me of the sleepovers I'd had as a kid, where we'd build forts out of couch cushions, blankets, and whatever else we could get our hands on. The cost was $50 per night. For $10 less per night, I'd stayed at a Lonely Planet recommended boutique hotel in the capital of Laos. But this is Tokyo, where cheap hostel dorm beds start at $40 per night, so I chalked the difference up to a little privacy for my final night in Japan. Grief! I was expecting them to be cheaper for some reason. Space doesn’t seem too bad there as they’re just as you said, glorified bunk beds. I’d prefer (or not?!) the ones where you’re literally stacked on top of each other mind, the place you stayed at looks like an office. Yes, agreed, my place does look like an office, and maybe that’s because it’s more of a hostel/budget hotel for tourists, than a place where the local businessmen go to crash for the night. Looking at Wikipedia’s entry, the prices quoted are $25 – $50, so mine was on the high end because it’s aimed at foreigners I guess. Not a lot of room but looks like they still find space to work. I’m 6″4 but for $50/night I’m sure I could get my accordion on. Do they have these in all cities? Is the wi-fi included in the $50? I think you can find them in all of Japan’s major cities, but the highest concentration would be in Tokyo, especially Shinjuku which is a major business district. And yes, that included wi-fi. I stayed in a capsule (god, that sounds strange to type) in Tokyo as well. Mine looked more like a sleeper bunk from some old Soviet-esque train than a quiet study cubicle. Maybe that had something to do with paying only $18 a night though?! A fun read, but not sure if I would actually try one. After a long day seeing the sights of a city, I like to stretch out and relax. Near the JR Shin-Imamiya station in Osaka and Minami Senju station in Tokyo, you have Japan’s two largest “slums”. Slums is relative as a slum in Japan is nicer than most nice neighborhoods the world over. 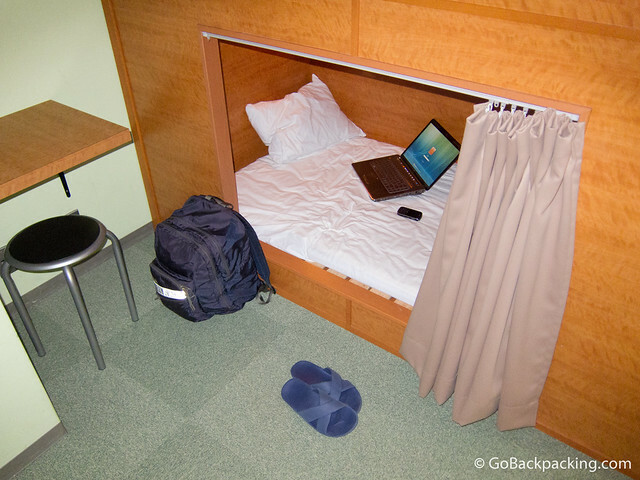 In these areas, it’s possible to find Japanese style rooms for under $10 a night, although if you can’t speak Japanese your options will be more limited and you should expect to pay between $20 to $30 per night. That’s still quite a bit cheaper than a capsule hotel or a hostel bed.